1. Log in to your pinterest account. 2. Go to Widget builder page. Go to top menu bar on pinterest and click your username select board from drop down menu. copy paste your URL from address bar. 5. Under advance setting, you can change the size of the image and board size. Click preview to see board preview. 6. Now you can see 2 code below to preview button.So, you have to add these 2 code to your blog. 4. Code will something like below. Thanks for this widget ... this is wonderful for blogs. Can i show Tweeter Tweets similarly on Blogger? 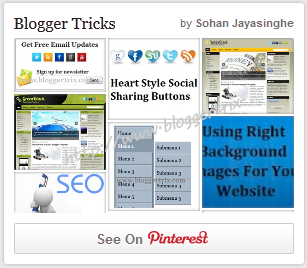 I appriciate that you have added such a great post for pinterest, but you should also write about latest pin widget... that it is only available for business owners such as: http://www.business.pinterest.com. Hope this will help you to make this post more effective and good informative. Wow, great post, this is post that i looking .. I am happy to see this post here. I am know more things about this. I am happy to see this post here, this is really informative. This is beneficial for me. Nice way to provide information. I am also use this on my blog. Thanks for this article. Nice post and very well managed. Great Post, I wonder how should i afford to miss such updates. Thanks for it keep posting. Thanks for the post dear. I was searching for this kind of info since many days. Keep posting :). Really nice information, thanks for this widget. Helpful for me.